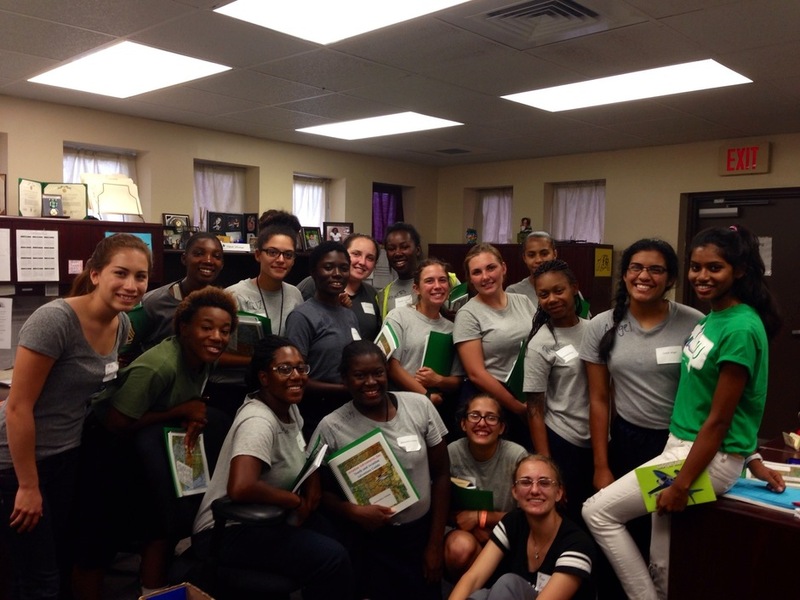 FLY-CA Girls Aviation Program - Aviation Adventures, Inc.
September 2014 - a New Beginning: After 6 months of organization we were finally able to get our first full semester program with the Florida Youth Challenge Academy. Seventeen girls were selected out of the 33 that applied for the program. We have partnered with Jacksonville University WAI students who are running this program. We are excited to see the college students bring such spirit an enthusiasm to the girls at the FLY-CA program at Camp Blanding, FL. We received an up-date on the first Aviation Adventures/FLY-CA meeting Sunday, September 28, 2014. Our Jacksonville University volunteers, Kritika Vincent, Ileana Pineda, and Kirsten Nieber, the group’s leader on this project, joined with FLY-CA personnel Ms. C G, Mr. H, and Mrs. G.
“We spent the first half hour on “Getting to know you” and the guidelines for our group. The rules were clearly explained and it was also explained that at end of the Class the Cadets would receive either a Certificate of Attendance, or earn a Certificate of Completion. At this point, all of the participates have 100% on their assignments. The first assignment was making a “Thank You” card; the second was to complete Module 1 Air Race Past and Present from their Adventure Guide, prior to the first meeting. During the meeting we worked on Module 2 United States Geography. The rain ran us inside so we were all in the RPM hall way. The main part of the exercise was to identify the State from an outline drawing. It was really nice to watch the Cadets work together for the answers. Mrs. G, Cadet M G’s Mentor, also participated and helped the girls. Mr. H was in attendance and very helpful with the next geography exercise, a relay race activity, using the giant foam puzzle that Aviation Adventures sent us. This was a lot of fun! We closed the meeting with Kirsten showing the Cadets some of her tools she uses when flying and the floor was open for questions. Thank everyone who came together to bring this workshop to the Cadets at FLY-CA. We appreciate the enthusiasm of the JU students and the time they put in to bringing aviation to these youth.